From electrical power to leather goods, the fruits of Somaliland are plentiful. Investors are urged to explore the benefits. 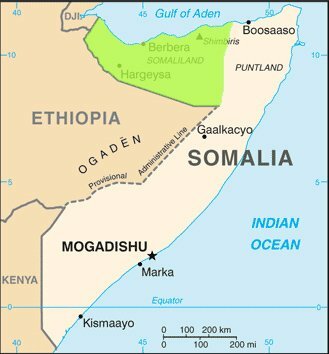 Somaliland is a self-declared independent state in the Horn of Africa that is recognised internationally as an autonomous region of Somalia. Tiahlo told How we made it in Africa about the potential Somaliland holds for investment and shared his advice to foreign investors. Below are edited excerpts. What are some of the common misconceptions among investors when it comes to Somaliland? There are many perceptions that are very real, such as lack of insurance... There is also a lack of international respected banking facilities and an issue with the unenforceability of contracts within Somaliland law [which] is not internationally recognised. The misconception, however, is that there is difficulty in developing business with locals. In fact, the Somalis are excellent traders and with such a small population within Somaliland, there is great potential for business if only infrastructure and electrical availability could be raised to the standard which has been so recently achieved in Ethiopia. What are some of the SDC's [Somaliland Development Corporation] key areas of interest in Somaliland? Some agendas are under development and must remain confidential until parties wish to share activity in the public domain. Nevertheless, a good example of the SDC's activities to date, and which has been raised publicly, is our focus on bridging the economic interests of Ethiopia with Somaliland via trade access to the Red Sea port of Berbera (the opening up of the Berbera Corridor). The SDC is also developing interests in the eastern Somali region of Ethiopia through its administrative capital of Jigjiga, a city less than a 45 minute drive from the capital city of Somaliland, Hargeisa. Both the Somalis in Ethiopia and Somaliland share a primary economic interest in trading livestock – goats, sheep, cattle and camels – mostly shipped to the Arabian market or traded as live animals to be locally slaughtered. A by-product of the trade is the production of hides and skins. The SDC is working to build up new business in this sector, initially through the exporting of hides and skins from Somaliland to Ethiopia, with a British leather goods company being a potential buyer. Building a trading link between Somaliland and Ethiopia is potentially [the] most attractive agenda. Ethiopia has a population of about 90 million, with a GDP [growth] of 10%+. Major infrastructure developments (including the availability of hydroelectric generated power) are underpinning local economic growth that is placing the region towards the top of the economic power houses of Africa. Electrical power availability also [leads to] major changes in consumer lifestyles. Whereas household refrigeration was rare 10 years ago, many families now are moving into the marketplace to acquire a household fridge. This means change in the way food is bought and stored, in particular meat products. Instead of slaughtering a goat, households will move towards buying, say, a leg of goat from a supermarket or butcher's shop. The consumption of a protein-based diet will likely increase and therefore the demand for meat products from eastern Ethiopia and Somaliland will attract increasing local demand. This example of rapid change in the economic landscape is where the SDC is positioning itself. Describe the potential in some of these business and economic trends? Where is growth coming from? Somaliland's economy has been based on rearing livestock. Its market has been mostly limited to export to the Arabian market with major demand fluctuations, dependent upon local customs and religious observances (Ramadan, Eid, etc). The potential to trade livestock slaughtered for chilled or frozen sale opens up major new markets in Ethiopia and beyond, to Malaysia and Asian markets. This potential is best realised initially as with the SDC approach of operating via Jigjiga, where electrical power is in cents per kWh versus Somaliland cost of power presently in the range of US$1.3 to $1.5 per kWh. Somaliland does of course have potential oil and gas resources, though these have yet to be proven. This investment sector has in the past attracted the less established oil companies and, as elsewhere, the reality of oil and gas exploration is that it is a long term highly capital intensive investment, with high risk that typically is the reserve of major corporations, which in turn have the technical capacity to do the work as well as the asset spread to diversify risk. In this regard, the SDC is on record as having the agenda to open up dialogue with the major oil companies that have held concessions in the region and to develop good relationships with the local communities where future oil and gas exploration and hopefully development activity is likely to take place. Presently economic growth is coming from local and diaspora Somali investment. The investment into the extension of the optical fibre system from Djibouti through to Somaliland is a good example. You may be surprised to know that just 10 minutes from Djibouti lie offshore islands that offer unique boutique resorts potential, so eventually there is the potential for the establishment of high end tourism. What sectors in the region have typically seen good investor returns? The informal money transfer business has been most profitable. Diaspora transfers have been a source of major earnings. Local mobile phone companies have also been seeing major returns. Drawing from your knowledge, what advice do you have for foreign investors looking at the region as an investment destination? It is important to work with local communities and ensure all business and inward investment is in the best interests of local hosts to ensure longevity of such projects.